One of my senior-level seminar courses took a break from our normal lecture schedule last week to look back at the September 11, 2001 terrorist attacks and their impact on journalism, culture, and diplomacy in the United States and abroad. I titled the series, “Effects of 9/11 – 10 Years Later,” and opened it to students across the campus. With the immense anniversary coverage being prepared for the weekend ahead, it seemed like an excellent opportunity to look back (For more on the extent of the coverage, see Paul Farhi’s piece in the Washington Post). The idea gained steam with the launch of the new Understanding 9/11 page from the Internet Archive, a massive collection of television coverage from the original Sept. 11, 2001 broadcasts of major news networks around the world. I arranged the lectures around clips from the archive and other corners of the Internet. I was quite pleased with the discussions that took place. My colleagues and I wondered if the students – most of them 10-11 years old when the attacks occurred – would have the same memories of that day as we do. As it turned out, the associations were still strong, and sparked some great debate. We began the series by watching a montage of major events from 9/11/01 as compiled by the Internet Archive. Not only did it capture the most important moments of the day, it did so by using a number of media outlets, many of them international. It was particularly interesting to note the intensity and vividness of the images being used by outlets in Tokyo, London, or Moscow compared to the wide-angle helicopter shot so often used to fill the American airwaves – a frame so often utilized to depict our bombing of other nations. 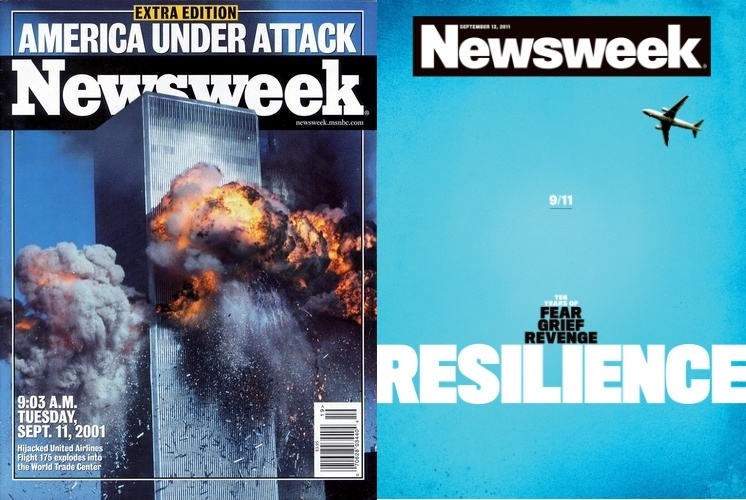 Along the same lines, we looked at magazine covers from Time and Newsweek – both from September 2001 and the 10th anniversary editions that hit newsstands last week. 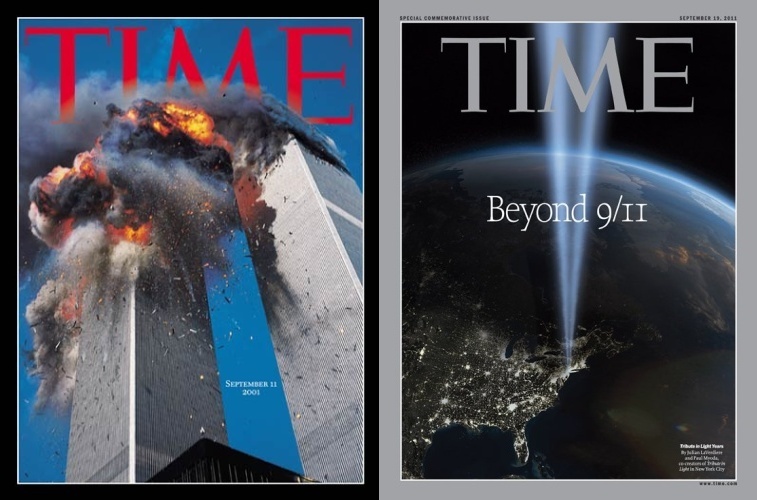 The 2001 covers for both publications were dramatic stills of the second jet exploding into the South Tower. Graphic. Emotion-stirring… even now. Some students argued that those images should have never been used, even in the immediate aftermath of the attacks. Indeed, there was a palpable uneasiness in the room watching the original broadcasts of the attacks. There was pain in reliving those moments. However, one of my goals for this series was to put us back in the immediate post-9/11 mindset. How else were we to truly understand the decisions made and actions taken in the wake of the attacks? Hindsight is 20/20, so they say. I wanted to blur that a bit as we continued the discussion. 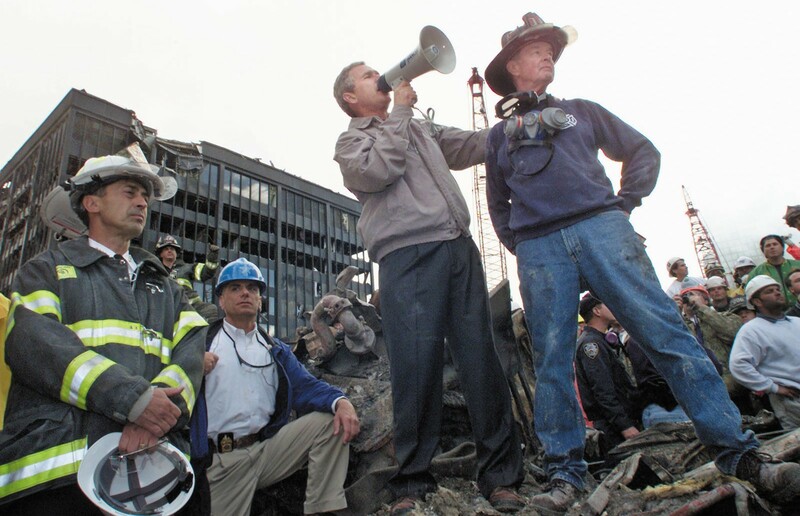 We looked at a number of speeches by President George W. Bush – his brief address from a Florida school, his primetime statement the evening of the attacks, his iconic bullhorn speech standing amidst the rubble at Ground Zero, and his Sept. 20 address to a joint session of Congress. We heard him outline the War on Terror – the military philosophy that would come to define the next decade. We heard him frame the good v. evil narrative. We heard him introduce the majority of Americans to al Qaeda and Osama Bin Laden for the first time. And we heard him say some things that, as wars grew long and critics grew loud, we might find ourselves a bit surprised to remember that he said. Things like his numerous attempts to clearly delineate between the radical Jihadists of terrorist organizations and the rest of the Muslim world. And like his forewarning that the War on Terror was uncharted strategical territory, and would likely be fought over a long period of time. We looked at the entertainment world’s reaction. The pulling of a Spiderman movie trailer. David Letterman searching for laughter’s appropriate place. Toby Keith encouraging us to place boots firmly up asses (it’s the American way). Baseball uniting a grieving city. And again, we asked questions. What to do with syndicated shows that reference the World Trade Center, like this clip from The Simpsons? Everyone loved Budweiser’s heartfelt Super Bowl ad – even to the point it took on a charitable persona through a popular chain e-mail that insisted the ad only ran once so that Budweiser wouldn’t profit off of it (not that the logic of that argument makes any sense). But wait, who is to say that after seeing that commercial, someone at a bar didn’t order a bottle of Bud and have a drink for the legacy of those fallen first responders? Was Budweiser profiting off our national tragedy? The students tended to accept that advertising is a part of mass media, even in delicate subject matter. Furthermore, the Budweiser debate led to an interesting discussion about true American brands. We asked how many other companies could have pulled off such a delicate memorial ad, just a few months after the tragedy? They had to be quintessentially American, and with a history of intertwining deeper cultural messages into their publicity. The only brands we could think of were those of the American automakers, like Ford or Chevrolet. Budweiser found themselves in a unique position as a brand that could rise to such an occasion, and they delivered. We spent some time looking at the global reaction to the attacks. Particularly notable was the outpouring of support from Europe. The class watched with intrigue as we saw people of other nations waving American flags and singing the Star Spangled Banner in international news packages. Many in the class couldn’t believe the show of support from citizens of lands thousands of miles away. We reflected that, though the ceremonies in St. Paul’s Cathedral in London spilled into the streets, we never lifted a British flag or even uttered a brief “God save the Queen” in the wake of London’s own terror attacks in 2005. Perhaps European media do a better job of conveying the realities of international tragedy than their American counterparts. Perhaps this reaction only occurred because of a globalization mechanism that places the mightiest nations on pedestals. Perhaps those Americans on the pedestal just aren’t as sympathetic to the rest of the world as other people groups. By the time it came to talking about long-lasting effects of the September 11 terrorist attacks, the deck had pretty well been stacked. We were in as close to an immediate post-9/11 mindset as we could ten years removed, which was exactly where we needed to be to understand the course the United States took. The speeches of President Bush dominated the dialogue, entertainers and musicians and athletes were praising the work of our leaders. No contrarian voices were to be found, except for Bill Maher, who was dismissed as quickly as his network television show after public outrage at his dissenting opinions. That was the climate post-9/11. The opposition was small and silent, out of fear of public condemnation. The administration and its supporters framed the narrative without retort – be it from political opponents or a national press corps. As Jowett (1993) bluntly stated in the aftermath of the Gulf War, “In times of national crisis, when the impulse of the country is to pull together in the face of adversity, the large majority of the public do not give a damn whether they are being propagandized or not!” (p. 299). So we looked at post-9/11 measures – the Authorization for Use of Military Force, the USA PATRIOT Act, the extension of the War on Terror into Saddam Hussein’s Iraq – through this lens. Suddenly, it became easier for these students – many of them who opposed the national security philosophy used for most of their lives – to see how it came to be. If anything was accomplished through the lecture series, it was that we saw how a country can embark on defining shifts in times of tragedy and panic, and how important it is for the people and the press to remain vigilant in holding their government accountable, even in times when it seems like the most drastic steps are the necessary ones. Fruitful thought and discussion occurred; what more could an instructor ask? Domke, D., Graham, E., Coe, K., John, S., & Coopman, T. (2006). Going public as political strategy: The Bush Administration, and echoing press, and passage of the Patriot Act. Political Communication, 23(3), 291-312. Jowett, G. (1993). Propaganda and the Gulf War. Critical Studies in Mass Communication, 10(3), 287-300. Payne, K. (2009). Winning the battle of ideas: Propaganda, ideology, and terror. Studies in Conflict & Terrorism, 32(1), 109-128.